Fresh herbs are seriously popping up everywhere. I’m lucky enough to have them growing in my front yard, but you can easily find them at your local farmer’s market or even your local grocery store. 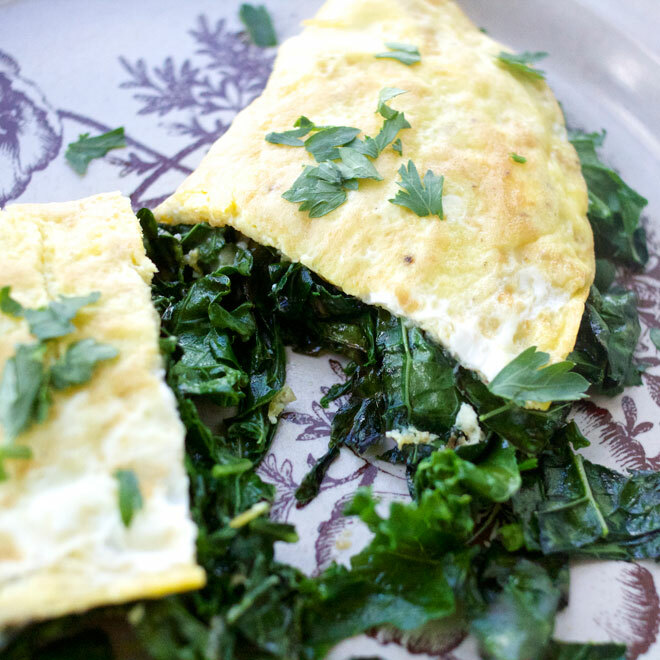 The trick to making this omelet tasty is in the seasoning. While the inside is filled with beautiful green goodness (the kale, scallions and garlic scapes), the egg takes on a beautiful flavor from the addition of salt, pepper, basil and oregano. 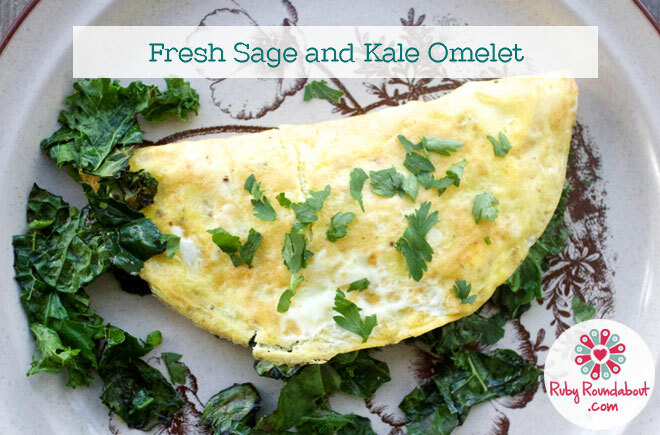 This is not an omelet for the kids, but it’s certainly one that you will enjoy. This is the perfect beginning for an even more complex omelet – possibly adding in some fresh tomatoes, radishes, sweet bell pepper, broccoli or anything else you may have on hand – although it’s delicious without all of the extra frills. This will truly keep you full until a late lunch, so you won’t need to worry about spending so much time in the kitchen. Kale is a superfood on its own – offering plenty of iron, antioxidants, and vitamins K, C, and A. Scallions offer vitamin K and fiber, while fresh sage offers antioxidants, is anti-inflammatory, and helps improve brain function. Spinach is high in iron and anti-cancer vitamins and minerals, and the combination of the variety of greens together is a perfect way to start your day with tons of healthy vitamins. This recipe creates one serving. Over medium heat, heat olive oil in a pan. Once pan is heated, add in your kale, spinach, scallion and garlic scapes. While above mixture is cooking, whisk together eggs in a small bowl with basil, oregano, salt and pepper. Once greens have wilted and scallions have begun to brown, remove from heat and cover. In another pan, add a small amount of oil to cook your eggs over medium heat. Pour in your egg mixture and cover to steam. When eggs are almost completely cooked, add in your greens mixture to one side of the egg. Fold over the other side so that the greens are enclosed within the eggs. Let cook on one side for 30 seconds, then flip and cook on the other side for another 30 seconds. Serve, and top with fresh sage. Enjoy! For a less cholesterol, calorie and fat version, replace one of the full eggs with just the whites.